The Washington Fire Department blocked off part of West Elm Street near South Hinde Street Thursday afternoon after a gas line was punctured. The Washington C.H. 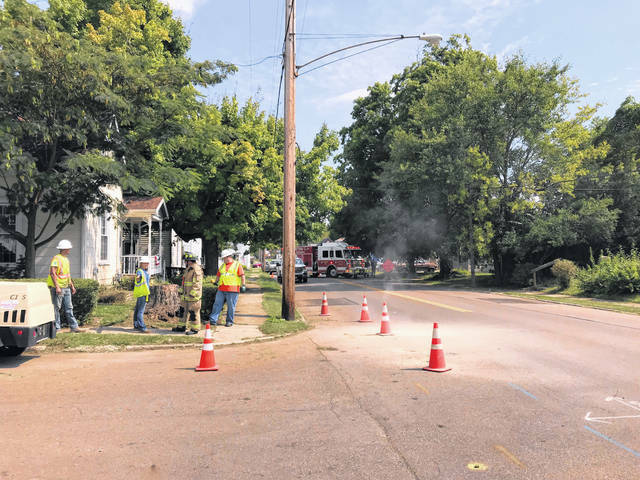 Fire Department blocked off part of West Elm Street Thursday afternoon after a gas line underneath the street was inadvertently punctured by Vectren. Shortly after 12 p.m., crews with the energy company were checking for a gas leak and during the process, they drilled into the gas line, causing a leak that emitted a strong odor, according to authorities. The gas leak was contained and the line was repaired shortly after 1 p.m. The street was then reopened. The Washington Police Department and Fayette County Life Squad also responded to the scene. https://www.recordherald.com/wp-content/uploads/sites/27/2018/09/web1_4B60D775-6E74-49CD-A26E-EBC80B0A9F03.jpegThe Washington Fire Department blocked off part of West Elm Street near South Hinde Street Thursday afternoon after a gas line was punctured.